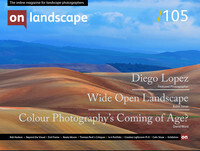 I have been a photographer for over 40 years and have always had a fascination with the land. This project is part of ongoing work exploring the modern relationship of people to the land and how landscape is depicted in visual images. For me it is always a two way process; how people use and shape the land and how the land shapes people. It is also an intensely personal exploration of my own relationship with landscape. Previous projects have included “Farmwork – Men and Women on the Land” published by Chatto and Windus and shown as touring exhibition to over 80 venues in the UK and Ireland and “M40 Warwickshire” at the Ikon gallery Birmingham. The Farmwork and M40 projects are housed at The Museum of English Rural Life at the University of Reading. Growing up in a small Warwickshire village in the 1950s and 60s gave me unlimited access to the countryside. During the long hot summers I was out all day only returning home when hungry. We roamed far and wide, drank from streams, climbed trees, made hidden dens and generally explored every part of the varied landscape that surrounded the village. It is easy to look back and see what appears to have been an idyllic childhood but what the memories omit are the grinding poverty and the fact that we learned that the land we played on was owned and used by someone. We were often told to clear off, to stop rolling in fields of standing corn and learned to swear when a local farmer ploughed deep furrows round our favourite winter sledging field. The playground at the local secondary school looked out over fields and it was not uncommon to see a farmer herding cows or to see sheep lambing. There was also a large garden where we were taught the basics of horticulture. The food went to the kitchen to be used in school dinners. From an early age we knew what the land was for. This was helped along by my father who started life as farm worker. He passed on his knowledge of the countryside and instilled a respect for the land. When I started doing ‘serious’ photography it was probably inevitable that I should turn to the land as my subject of interest and inspiration. In the 1980s I completed a large scale documentation of agricultural work. This project was called “Farmwork”. The aim of the project was to show the hidden face of agricultural work and to challenge the romantic view of working on the land. It produced two touring exhibitions and a book. Following Farmwork came a project about the building of the M40 through the land I loved so much. “M40 Warwickshire” was shown at the Ikon Gallery, Birmingham in 1988. Again this was intended to be a realistic look at the rural life that was being destroyed by so called progress. In 2003 I moved to a small village in the Peak District. Like many others around here the village owes its existence to lead mining and limestone quarrying. For several years I wanted to photograph my new surroundings but did not have a clear idea of what I wanted to say but I knew that the Peak District landscape was more than the ubiquitous traditional landscape photographs. In 2013 I started photographing the quarries and works associated with mineral extraction and processing. What inspired me was the view from a local track. On one side there are amazing views over the hills and on the other way there are deep quarries and large cement and lime works. In one place it was possible to see both sides of the Peak District and my new project was born. From the start I wanted to say that there is another view of the Peak which is seldom seen and so I began to photograph the quarries and works located around Buxton mostly from publicly accessible land. The biggest irony is that it is the rock that makes the hills provides the materials for modern life. I would go further and say that we rely on the land, the landscape, for all our needs. Landscape is not an abstract concept, something out there separate from us, but is the source of all our needs. Another early decision was to make the images easily accessible to a wide audience. I immediately decided on large, unframed prints mounted on Diabond, an aluminium substrate. The idea being to remove as many barriers as possible between the print and the audience which I hoped would lead to greater engagement with the images. I took some inspiration from Edward Burtynsky who has photographed deep mines and industrial sites in many parts of the world. In an interview he said that for every building there is a corresponding hole in the ground. I would add every road and railway to that. The logic of the statement is that if we want new constructions, even a kitchen extension or garage, then the raw materials have to come out of the ground. The biggest irony is that it is the rock that makes the hills provides the materials for modern life. I would go further and say that we rely on the land, the landscape, for all our needs. Landscape is not an abstract concept, something out there separate from us, but is the source of all our needs. That is what influences my photography – a relationship with the land that includes all aspects of life and not just the view. That is not to say that I advocate the wholesale destruction of the land, quite the opposite, but I would argue that we need a relationship to landscape that is not based on an idealised image of what it should be. Also, I discovered a stark beauty in the colours and form of the quarries, something I did not expect and which many people comment on.